Did pretty well when he came on. Not marking as such, but more being in the zone to cut out the cross. He should have been goal side of Maguire and wasnt. Not saying i'm blaming Jones for losing Maguire but i thought Jones went to RB and Young to RW? Pretty sure Ole did the same switch last time he brought Jones on late. Even though it was Young marking McGuire at the beginning, but Jones was marking no one at that point. So why not keep an eye on McGuire? Probably was, to be fair. Really? I would say different. First two games with Ole he was good and after that came real Jones. That fitness excuse is over. He is huge liability. And that is it. Just not good enough. The thing is that real test for big clubs defenders are big games. It is easy to be good at OT against Cardiff or Fulham, clubs who don't attack you and when they attack, they do it with 3,4 players so defender has protection in other players. But in big games you must be composed whole game and often it is you and attacker one on one. In every game when other team put pressure on us and attack us, he is lost. I read that he is hoping for new contract. If he went in public with that i am afraid that he will get that contract which is disaster. Fergie always liked playing central defenders at right back. I’m fairly sure I remember Jones looking very good in that position early on in his United career. With Valencia and Young showing their age (and Dalot showing his youth!) am I the only one who thinks we should consider Jones at RB? I just want him out. He has been here for way to long without ever really being ready or available. Ship him and Rojo out and get Alex T and Koulibaly in.. I trust Ole not to be sentimental regarding this. I hope Ole doesn't consider that I'll be honest. I think he'd be terrible at right back in 2019. You think he'd be a good attacking outlet for us ? I do actually. From memory he was very good when he last played that position. He’s obviously got a decent cross, as we know from the whole Van Gaal getting him to take corners debacle. Don’t get me wrong. I’m not saying he’d be one of the best (or even better) RBs in the league. Just worth a crack now that the other options are all struggling. Yeah but when was that? 7? 8 years ago? I think injuries have taken away any kind of dynamism he once had and he'd struggle hugely out there. I don't think Van Gaal getting him to take corners proves Jones is a decent crosser, it proves Van Gaal was off his head. We definitely need an upgrade at right back though, Ashley Young is clearly not good enough. Of the centre backs we have the only one i would try at RB would be Bailly. He looked decent there the one or two games Mourinho started him at RB. Did he ever play there before we signed him? A few times Transfermarkt says he did anyway, according to them he's had 5 games at RB and 2 at LB in his career. He has a lot of good qualities but i'm still not convinced about him as a CB. RB might be an option for him. He has the pace and athleticism for it. If we were to get a direct winger on the right, then yes, he'd certainly be an option. As it is, Jones behind Lingard/Mata just wouldnt work. So Phil has signed a new deal until 2023 with an option to extend for a further year. Now that is going to upset one or two on the Caf methinks. How simply delicious. Perhaps Ole rates him after all. 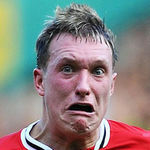 My issue with Phil Jones is that he's always injured. However, when fit, he's a good defender, in my opinion, and the United staff obviously think the same. No Director of football so let's just let our interim manager decide. Sounds quite right to be honest. This is how I feel about him as well. Personally I wouldn't have given him a new contract, but he's performed very well over the last month or so, so I'm certainly not going to whinge about it like some others. As has been said elsewhere, the club were already in negotiations with Jones before Ole's time. Ole had very little to do with this. Good today, shame he didn't get to celebrate his new contract in spectacular fashion with a screamer. One of the best games he has played in a long time. Very good in all aspects, moving well, defending smartly, confident use of the ball. He is a good player with probably the most balanced attributes of all our defenders, always been a matter of him putting it together, staying fit. Anyone able to pull together stats on how frequently we concede with each defender in the side post-Ferguson? I can’t find a source, but feel that we keep more clean sheets and concede less with Jones, despite his gaffs. Vidic was made to look an idiot by Torres for a number of seasons in comparison. Did his best to assist Babel at the end though, Phil Jones in a nutshell. Good that he didnt but i still dont want him as first choice centreback. Had a wobbly start but settled in and was fine overall, almost bagged a goal as well. Defenders get held to insane standards. People really need to go back and watch season review vids of years when Bruce/Pallister were playing and even Rio/Vida. See how many goals we conceded that in isolation would lead to criticism. Defenders get piled into for even conceding a chance these days let alone a goal. Didn't help that snake in charge was happy to create and feed into the narrative that they were all dreadful. He was a beast today. I enjoyed that performance. Well deserved assist. He was good. Could be because Mitrovic was targeting Smalling so Jones had a easier game. If Jones can play LCB when Smalling is in the team, why not play him LCB and allow Lindelof to play his preferred and more effective RCB? Really? Why did I think Lindelof played on the right when playing with Bailly but was moved to the left when playing with Jones.